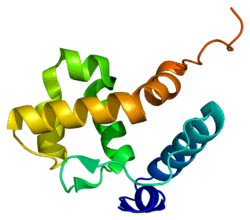 AT-rich interactive domain-containing protein 1B is a protein that in humans is encoded by the ARID1B gene. ARID1B is a component of the human SWI/SNF chromatin remodeling complex. Germline mutations in ARID1B are associated with Coffin-Siris syndrome. Somatic mutations in ARID1B are associated with several cancer subtypes, suggesting that it is a tumor suppressor gene. ARID1B has been shown to interact with SMARCA4 and SMARCA2. ↑ "Entrez Gene: ARID1B AT rich interactive domain 1B (SWI1-like)". ↑ Tsurusaki Y, Okamoto N, Ohashi H, Kosho T, Imai Y, Hibi-Ko Y, Kaname T, Naritomi K, Kawame H, Wakui K, Fukushima Y, Homma T, Kato M, Hiraki Y, Yamagata T, Yano S, Mizuno S, Sakazume S, Ishii T, Nagai T, Shiina M, Ogata K, Ohta T, Niikawa N, Miyatake S, Okada I, Mizuguchi T, Doi H, Saitsu H, Miyake N, Matsumoto N (April 2012). "Mutations affecting components of the SWI/SNF complex cause Coffin-Siris syndrome". Nat. Genet. 44 (4): 376–8. doi:10.1038/ng.2219. PMID 22426308. ↑ Santen GW, Aten E, Sun Y, Almomani R, Gilissen C, Nielsen M, Kant SG, Snoeck IN, Peeters EA, Hilhorst-Hofstee Y, Wessels MW, den Hollander NS, Ruivenkamp CA, van Ommen GJ, Breuning MH, den Dunnen JT, van Haeringen A, Kriek M (April 2012). "Mutations in SWI/SNF chromatin remodeling complex gene ARID1B cause Coffin-Siris syndrome". Nat. Genet. 44 (4): 379–80. doi:10.1038/ng.2217. PMID 22426309. ↑ Sausen M, Leary RJ, Jones S, Wu J, Reynolds CP, Liu X, Blackford A, Parmigiani G, Diaz LA, Papadopoulos N, Vogelstein B, Kinzler KW, Velculescu VE, Hogarty MD (January 2013). "Integrated genomic analyses identify ARID1A and ARID1B alterations in the childhood cancer neuroblastoma". Nat. Genet. 45 (1): 12–7. doi:10.1038/ng.2493. PMC 3557959 . PMID 23202128. ↑ Fujimoto A, Totoki Y, Abe T, Boroevich KA, Hosoda F, Nguyen HH, Aoki M, Hosono N, Kubo M, Miya F, Arai Y, Takahashi H, Shirakihara T, Nagasaki M, Shibuya T, Nakano K, Watanabe-Makino K, Tanaka H, Nakamura H, Kusuda J, Ojima H, Shimada K, Okusaka T, Ueno M, Shigekawa Y, Kawakami Y, Arihiro K, Ohdan H, Gotoh K, Ishikawa O, Ariizumi S, Yamamoto M, Yamada T, Chayama K, Kosuge T, Yamaue H, Kamatani N, Miyano S, Nakagama H, Nakamura Y, Tsunoda T, Shibata T, Nakagawa H (July 2012). "Whole-genome sequencing of liver cancers identifies etiological influences on mutation patterns and recurrent mutations in chromatin regulators". Nat. Genet. 44 (7): 760–4. doi:10.1038/ng.2291. PMID 22634756. ↑ Hurlstone AF, Olave IA, Barker N, van Noort M, Clevers H (May 2002). "Cloning and characterization of hELD/OSA1, a novel BRG1 interacting protein". Biochem. J. 364 (Pt 1): 255–64. PMC 1222568 . PMID 11988099. 1 2 Inoue H, Furukawa T, Giannakopoulos S, Zhou S, King DS, Tanese N (November 2002). "Largest subunits of the human SWI/SNF chromatin-remodeling complex promote transcriptional activation by steroid hormone receptors". J. Biol. Chem. 277 (44): 41674–85. doi:10.1074/jbc.M205961200. PMID 12200431. Imbert G, Saudou F, Yvert G, et al. (1996). "Cloning of the gene for spinocerebellar ataxia 2 reveals a locus with high sensitivity to expanded CAG/glutamine repeats". Nat. Genet. 14 (3): 285–91. doi:10.1038/ng1196-285. PMID 8896557. Mangel L, Ternes T, Schmitz B, Doerfler W (1998). "New 5'-(CGG)n-3' repeats in the human genome". J. Biol. Chem. 273 (46): 30466–71. doi:10.1074/jbc.273.46.30466. PMID 9804814. Phelan ML, Sif S, Narlikar GJ, Kingston RE (1999). "Reconstitution of a core chromatin remodeling complex from SWI/SNF subunits". Mol. Cell. 3 (2): 247–53. doi:10.1016/S1097-2765(00)80315-9. PMID 10078207. Nagase T, Ishikawa K, Kikuno R, et al. (2000). "Prediction of the coding sequences of unidentified human genes. XV. The complete sequences of 100 new cDNA clones from brain which code for large proteins in vitro". DNA Res. 6 (5): 337–45. doi:10.1093/dnares/6.5.337. PMID 10574462. Xue Y, Canman JC, Lee CS, et al. (2001). "The human SWI/SNF-B chromatin-remodeling complex is related to yeast Rsc and localizes at kinetochores of mitotic chromosomes". Proc. Natl. Acad. Sci. U.S.A. 97 (24): 13015–20. doi:10.1073/pnas.240208597. PMC 27170 . PMID 11078522. Garin G, Badid C, McGregor B, et al. (2004). "Ischemia Induces Early Expression of a New Transcription Factor (6A3-5) in Kidney Vascular Smooth Muscle Cells : Studies in Rat and Human Renal Pathology". Am. J. Pathol. 163 (6): 2485–94. doi:10.1016/S0002-9440(10)63603-6. PMC 1892391 . PMID 14633620. Bouwmeester T, Bauch A, Ruffner H, et al. (2004). "A physical and functional map of the human TNF-alpha/NF-kappa B signal transduction pathway". Nat. Cell Biol. 6 (2): 97–105. doi:10.1038/ncb1086. PMID 14743216. Wilsker D, Patsialou A, Zumbrun SD, et al. (2004). "The DNA-binding properties of the ARID-containing subunits of yeast and mammalian SWI/SNF complexes". Nucleic Acids Res. 32 (4): 1345–53. doi:10.1093/nar/gkh277. PMC 390273 . PMID 14982958. Wang X, Nagl NG, Wilsker D, et al. (2005). "Two related ARID family proteins are alternative subunits of human SWI/SNF complexes". Biochem. J. 383 (Pt 2): 319–25. doi:10.1042/BJ20040524. PMC 1134073 . PMID 15170388.